Exclusive in the richest sense of the word, Aura Cozumel Wyndham Grand Bay offers guests luxury and elegance on a scale that will surpass every expectation. Decorated by internationally recognized design consultants "Interiorismo", Aura's 87 stunning suites welcome you with a warm and inviting blend of light, space, comfort and functionality. In this stunning ultra inclusive property the level of quality you will experience is an emerging revolution in hospitality. The foundation of Aura's philosophy is based on creating a unique contemporary environment that caters to uncompromising guests seeking the ultimate vacation escape. 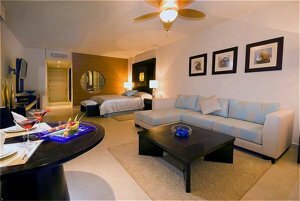 **Please note, Aura Cozumel Wyndham Grand Bay is an Adult Couples Only Resort. Classic avant-garde style decoration combined with a creative use of wood, stone, marble and tapestry ensures that the 87 luxury suites harmonize with the local surroundings. Aura Cozumel Wyndham Grand Bay has two fabulous restaurants; Isola - meaning island in Italian - an intimate restaurant specializing in signature gourmet Italian-Mediterranean fusion cuisine created by an experienced team of international chefs.